The School of Art's Interdisciplinary Seminar presents a free, public lecture by artist Jacolby Satterwhite, who will discuss his practice and its influences. That practice combines video, performance, 3D animation, fibers, drawing and printmaking to explore themes of memory, desire, ritual and heroism. His recent work, "The Matriarch’s Rhapsody," utilizes his mother’s drawings and music recordings. By repurposing everyday objects that appears in the drawings, Satterwhite queers their meaning in a performative animated narrative. His body and art facility, as an extension/interpretation of his mother’s voice and drawings, is an attempt to examine memory, insider/outsider art practices, contemporary surrealist practices, and queer phenomenology. 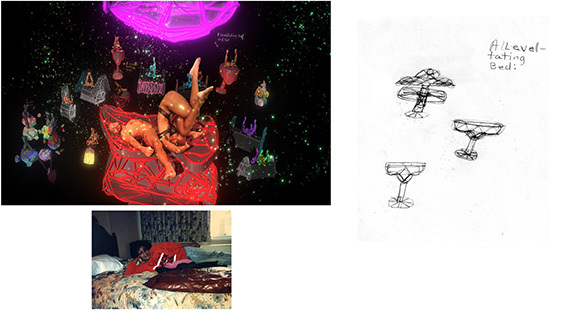 Jacolby Satterwhite received a MFA from UPENN, Philadelphia in 2010; a BFA from the MICA, Baltimore in 2008 and completed a residency at Skowhegan School of Painting and Sculpture in 2009. Satterwhite is a 2014 participant in the Whitney Biennial at the Whitney Museum of American Art, and New Frontier, Sundance Film Festival. Satterwhite also participated in “Radical Presence: Black Performance in Contemporary Art” at the Contemporary Art Museum in Houston, and Approximately Infinite Universe, Museum of Contemporary Art San Diego, San Diego California in 2013. His work has recently been exhibited in “Shift: Projects | Perspectives | Directions”, Fore, and “When the Stars Begin To Fall” at the Studio Museum in Harlem. His videos have been featured on “First Look: New Art Online: Aboveground Animation: 3D-Form”, The New Museum; a Solo show at Monya Rowe Gallery; Sessions at Recess Activities, and a two solo shows at Mallorca Landings gallery in Palme De Mallorca, Spain.